We’re so excited to join with the 2017 Kentucky Rose of Tralee to raise scholarships for cultural arts classes in Lexington, and we’re hoping you’ll join us this Saturday, July 22 for our event. Some of the donations from our great community partners to support scholarships at Artworks. Door Prize Raffle Basket – Raffle Tickets: $1 each, 6 for $5 15 for $10: Our door prize basket is valued at $140 and includes a yummy “bundtlet tower” from Nothing Bundt Cakes; a tin of Jacob’s Afternoon Tea Biscuits from Failte Irish Shop; a Bluegrass Ceili Academy Tote Bag by Hi5 Prints; a “Kentucky is my Happy Place” Tee (Size L) from Shop Local Kentucky; 2 box combo gift cards from Raising Cane’s; 2 Buy-1-Get-1-Free gift cards from Pie Five Pizza; and the cutest pair of wee tiny Irish dance shoes from Bluegrass Ceili Academy. Brew Lovers Basket: Valued at $95, you’ll bid in our silent auction for: Beer snifters, a growler and T-shirt (size L) from Ethereal Brewing Company; a $25 gift card from Mirror Twins Brewing; 2 Town Branch Distillery tour Buy-1-Get-1-Free Tour Tickets from Lexington Brewing and Distilling/Alltech; and 3 Buy-1-Get-1-Free gift cards from Pie Five Pizza. Something Irish Basket: Valued at $150. This silent auction basket includes: a tin of Jacob’s Afternoon Tea Biscuits from Failte Irish Shop; a $25 gift certificate to O’Neill’s Pub and Restaurant; a $25 gift certificate for Failte Irish Shop; Café Citadelle Coffee & McVitties Digestives from Alltech; a Bluegrass Ceili Academy T-Shirt (Youth M) designed by Hi5 Prints; and Irish Dance soft or hard shoes (pending available sizes) from Bluegrass Ceili Academy. Something Sweet (and Savory) Basket: Valued at $100. 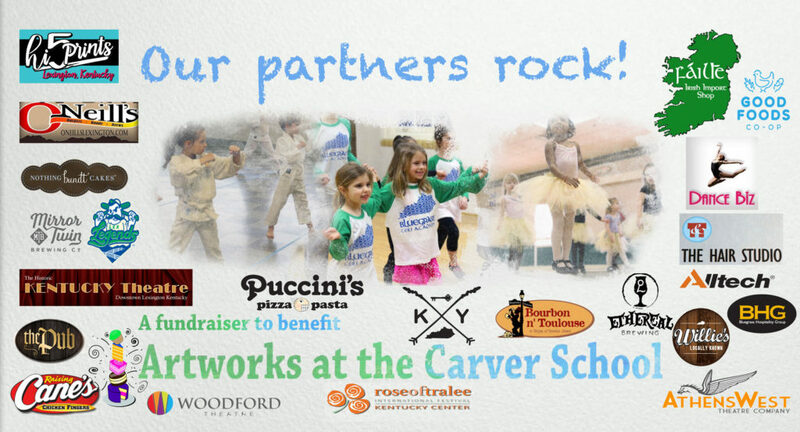 Get ready to bid on: Bundtlets for a YEAR from Nothing Bundt Cakes; a $25 Gift Card from Puccini’s Smiling Teeth Pizza & Pasta; a $15 Gift Card from Confused Confections Bakehouse; Café Citadelle Coffee from Alltech; and an extra large coffee mug from Bluegrass Ceili Academy. LEX Eats Basket: Valued at $190, this silent auction basket will keep you eating on the town while supporting cultural arts classes all year long: 4 box combo gift cards from Raising Cane’s; a $25 gift certificate from O’Neill’s Pub & Restaurant; a $25 gift card to Willie’s Locally Known; a $25 gift card for Puccini’s Smiling Teeth Pizza & Pasta; a $25 Gift Card to The Pub; a $20 gift certificate for Bourbon & Toulouse; a gift certificate for $25 off a $50 meal at any Bluegrass Hospitality Group restaurant; and 2 free pizza gift cards from Pie Five Pizza. 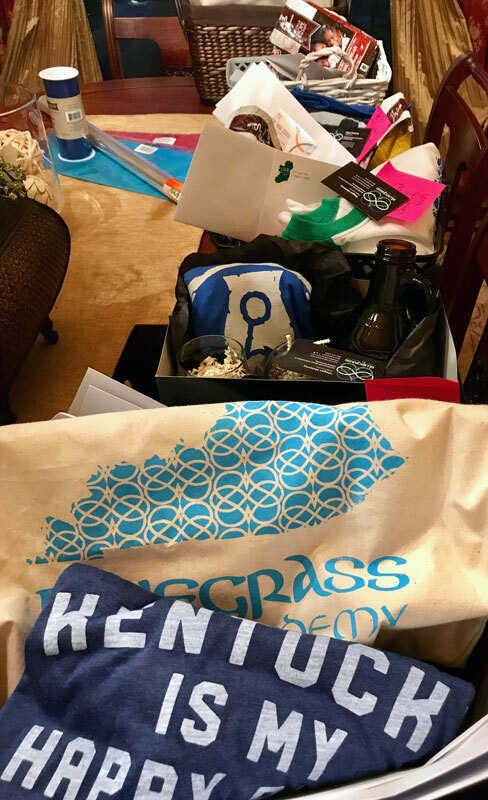 Treat Yourself Basket: Valued at $150, bid on this basket that will make you look, eat and feel better: a $50 gift card for services at The Hair Studio; a $25 gift card for Good Foods Co-op; a Kentucky “blue” T-Shirt (Adult M) from Shop Local Kentucky; 2 box combo gift cards from Raising Cane’s; Café Citadelle coffee from Alltech; and cozy sweatpants and a tank top (Adult L) from Hi5 Prints. On the Town Basket: Valued at $220. This basket will keep you entertained: 4 Club Seats Tickets (for 2017 Friday game: Kannapolis – 7/28; Charleston – 8/11; or Asheville 8/18) from the Lexington Legends; 2 movie tickets at the Kentucky Theatre; tickets for a performance at Athens West Theatre Company; 2 tickets to a performance at Woodford Theatre; 2 Town Branch Distillery Buy-1-Get-1-Free Tour Tickets from Lexington Brewing and Distilling/Alltech; and 2 box combos from Raising Cane’s. Just for Kids Basket: Valued at $85, this basket is full of fun children’s items: a $25 gift card from Dance Biz; a PBS Kids Gift Bag with a Splash and Bubbles tote and tumbler, Odd Squad DVD and badge, 2 coloring books and 2 children’s reading books donated by Caragh Babcock/Commonwealth Fund for KET; and a “Hello from the Otter Side” children’s T-shirt from Hi5 Prints. To provide scholarships for student at Artworks, an art and cultural arts center located at the historic Carver School.. The center’s purpose is to educate, inspire artistic creativity and enrich the lives of participants by providing opportunities and resources to people of all ages and abilities. 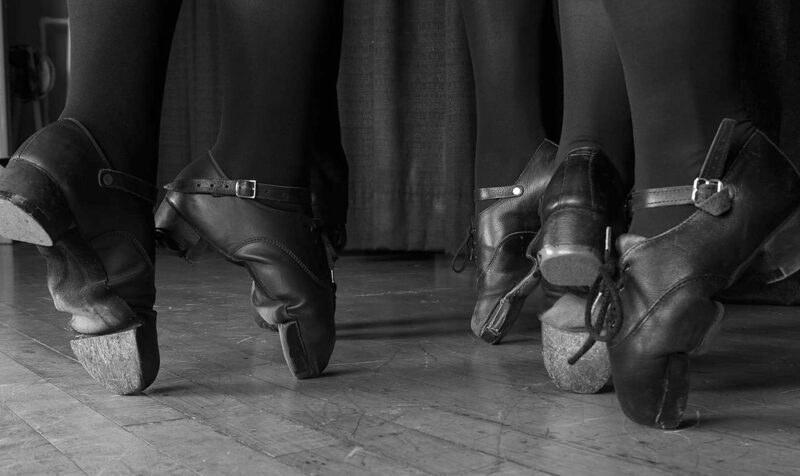 Classes in dance, karate, music and visual arts (such as pottery and print-making) are just some of the courses students can take. It’s an affordable option with high-level instruction for children and adults in our community. Can’t join us in person on Saturday? Help us meet our online goal by donating via our YouCaring site.